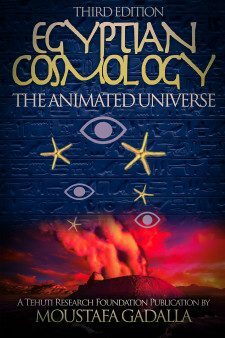 Surveys the applicability of Egyptian cosmological concepts to our modern understanding of the nature of the universe, creation, science, and philosophy. This new expanded edition surveys the applicability of Egyptian cosmological concepts to our modern understanding of the nature of the universe, creation, science, and philosophy. Egyptian cosmology is humanistic, coherent, comprehensive, consistent, logical, analytical, and rational. Discover the Egyptian concept of the universal energy matrix and the creation process accounts. Read about numerology, dualities,trinities, numerical significance of individual numbers thru the number ten; how the human being is related to the universe; the Egyptian astronomical consciousness; the earthly voyage; how the social and political structures were a reflection of the universe; the cosmic role of the pharaoh; and the interactions between earthly living and other realms; climbing the heavenly ladder to reunite with the Source; and more. This New Expanded Edition of the book is divided into five parts containing a total of 21 chapters and one appendix. 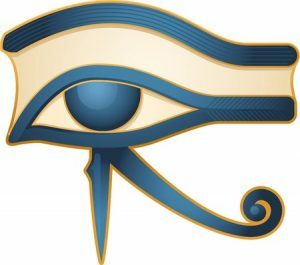 Chapter 1: The Most Religious will cover the deep mystical meaning of monotheism for the deeply religious Egyptians as well as an overview of their cosmic consciousness. Chapter 2: The Animating Energies of The Universe will cover the scientific understanding by the Egyptians of the state of the world prior to creation and the animating divine energies of the creation cycle. 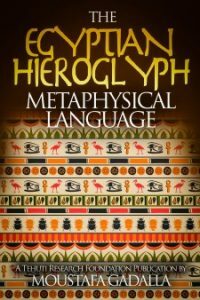 Chapter 3: The Pictorial Metaphysical Images will cover the scientific basis for the Egyptians’ pictorial symbolism of metaphysical concepts and the process by which the Egyptian ideographs were manifested in such figurations. Chapter 4: The Egyptian Creation Process Accounts will cover an overview of the three primary phases of the Creation Cycle. Chapter 6: The Dualistic Nature will cover the dualistic nature of creation and analysis of 14 various applications in the Ancient Egyptian system. 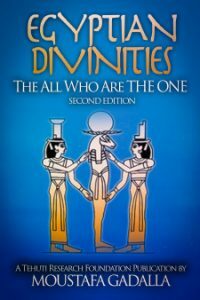 Chapter 7: Three—Trinities will cover this first odd number [one is not a number], the significance of the triple powers of a trinity in the universe; and a few applications of such principle in the Ancient Egyptian system. Chapters 8 throughout 14 will cover the mystical aspects of numbers four through ten. Chapter 15: The Human Being—The Universal Replica will cover how the physical and metaphysical components of man are an image of the whole creation. Chapter 17: The Cosmic Link will cover the role of the pharaoh as the cosmic link for the Ancient Egyptians and his demise if he does not serve his functions. Chapter 18: The Physical/Metaphysical Society will cover the various modes to maintain communications between earthly living and other realms of the universe. Chapter 19: Astronomical Consciousness will cover the advanced knowledge of astronomy and time keeping in Ancient Egypt, the zodiac and Sothic cycles; as well as the nature of the harmony of the (seven) spheres and the populace participation in its maintenance. Chapter 20: Our Earthly Voyage will cover the available ways for an individual to achieve reunion with the Divine Source, including Sufism, Alchemy, etc. Chapter 21: Climbing The Heavenly Ladder will cover life after earth, soul transmigration, progression along the various realms towards reunification and deitification. 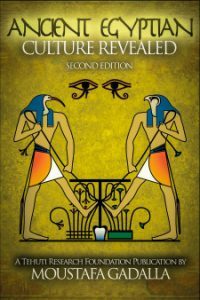 Appendix 1: covers the basic outlines of the Isis and Osiris allegory and analysis of its mystical meanings.